It goes without saying that praying for your retreat is paramount. Your speaker, your team, and your attendees will likely confront spiritual opposition during the weeks and days prior to your retreat. Prayer is our greatest weapon, but we sometimes forget how to use it. When I am knee deep in the trenches of retreat planning my creative juices sometimes dry up when it comes to praying for the retreat. I know I need to pray, but what should I pray? Should you encounter the same situation, I’ve got some help for you. There are many ways you can ensure prayer coverage for your retreat. Enlist women to serve on a Retreat Prayer Team. That team may wish to meet regularly (1-2 a month or weekly) prior to the retreat to pray over all the details. Host a Prayer Time for the retreat at your church. Invite all church members to participate and provide prayer prompts. Pray out loud during your Retreat Planning Team meetings. Set aside time for all of your team members to all pray out loud too. Once registration has been completed, divide up the names of the attendees amongst your Retreat Prayer Team and/or Retreat Planning Team and ask them to pray specifically for those women. 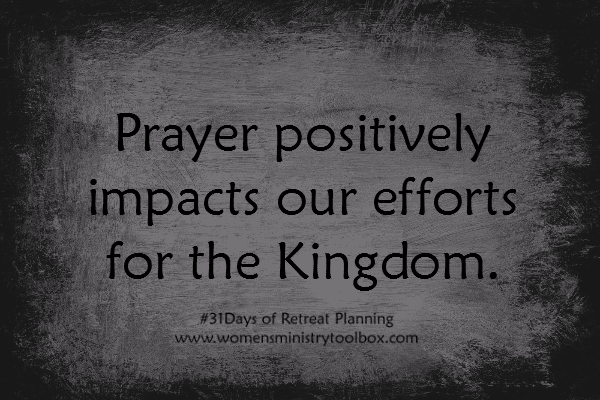 Distribute a Prayer Calendar to your team covering the 30 days prior to the retreat. 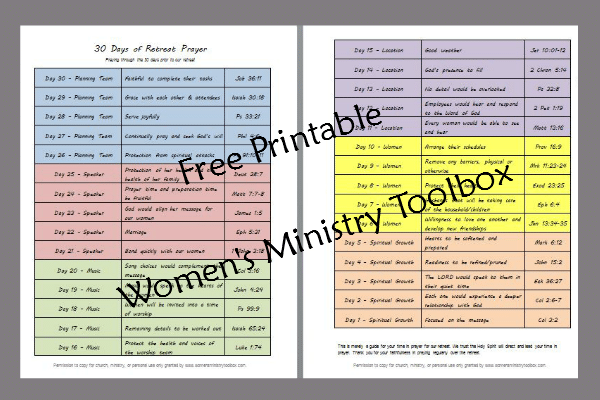 Years ago a dear friend on our Retreat Prayer Team created a Retreat Prayer Calendar. I hung her Prayer Calendar on my bathroom mirror. As I brushed my teeth each morning I would offer up the specific request for that day. For our retreat this past September I created a Prayer Calendar for our team. I’m happy to share it with you! You can tweak it for your own event or use it as is. Each day has a specific request and a scripture verse. I’ve grouped the prayers together by category – planning team, speaker, music, location, women, and spiritual growth. You are more than welcome to make copies for your retreat team. 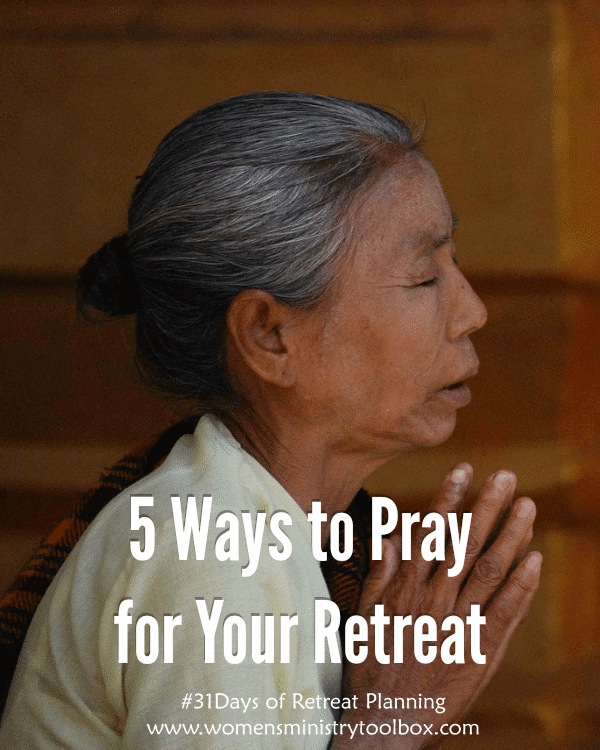 You may want to utilize all five prayer ideas for your retreat or just one or two. Do what’s right for you!